I hope you are having a great Tuesday! 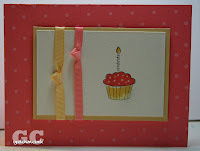 Today's card uses NO stamps...can you believe it? I have been hoarding my SU! rub ons for a while now and decided to break them out...I even used the big flower. These are from Sale-a-Bration, aren't they cute? This card literally took me less than 5 minutes to make! The longest part was waiting for the glue to dry on the button. 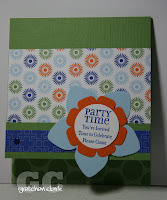 If you haven't been over the the Papertrey Ink website today...it is that time of the month! the 15th!!! New releases!!! check them out here. Supplies used (all SU! ): Love and Happiness Rub-on's (retired); Old Olive/Whisper White/Chocolate Chip cardstock; Choclolate 5/8 grosgrain ribbon; Olive Button. Today is my brother's birthday...so here is a big birthday shout out to my little brother...So if you are reading today...Happy 37th Birthday Tim! Here is the card I made him (and forgot to mail it so you are getting it late...sorry!). I tried not to girl it up too much, but I had to use some ribbon and a scalloped border. I cannot believe that April is half over....wow! I hope you all have your taxes done, because tomorrow is tax day! luckily we got a refund this year (whew!). 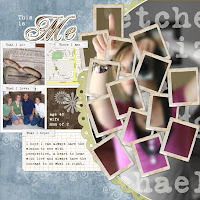 I am on week 3 of my digi class and the layout for this week is so cool! I have to take a picture of myself in the mirror...(not an easy task). Hopefully I will have an ok photo. I will post my layout later in the week. I hope you have a super Monday! Thanks for visiting!! I am so happy it is Friday! I am ready for the weekend *happy face* I finished my 2nd assignment in my digi class and wanted to post it...this is my son Josh, isn't he a cutie? A while back I sent in all my photos to http://www.scanmyphotos.com/ to have them put on disk. I started going through the files on Wednesday evening to look for a vertical photo of Josh...before I knew it, the whole family was hunched around the computer going down memory lane and laughing with me at some of the 80's hairstyles Mike and I were sporting (I hope the perm never comes back!). I also couldn't believe how young Mike looked, I was so glad I hadn't aged any...LOL! I could just look at pictures all day! Needless to say I got a little distracted. I was glad to get my layout completed last night and posted to our class gallery. I hope you have a wonderful weekend...it is supposed to be in the mid 9o's here in Phoenix on Saturday (perfect, since it is a dry heat). I hope you are having a super week! I am thrilled that we are already to Wednesday...boy the week goes fast when you don't work on Monday, ha ha! I just got my most recent Papertrey order on Saturday, so I was excited to try out some of my new paper/ink/ribbon from their Perfect Match collection...I really like this new color from the March Release, Berry Sorbet (doesn't it sound yummy?). 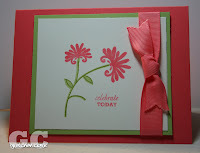 I grabbed my Spiral Bouquet stamp set to make a quick card for Mike's Nana who's birthday is 4/20 (April is our birthday month). I think she will like it. 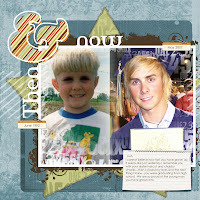 I am still really busy with my digi class (although I am having a blast! ), I had to put my final project from lesson 1 (Saturday Challenge) on the back burner and dig into Lesson 2. We are learning how to make our own digi patterned paper and create our own brushes (these are kind of like rubber stamps in PSE). I hope my brain can retain all this! Enjoy your Wednesday...thanks for checking out my blog! Wow...why is it when you have a Monday off the day just flies by...when I am at work it drags on? Mike and I had a full day yesterday. He did a lot at the church and I finished my Cre8tive Journal for my digi class. I have to say, this assignment really made me think. We had to make an 8 page (6in x 6in) journal with only quotes. I didn't have any quotes! 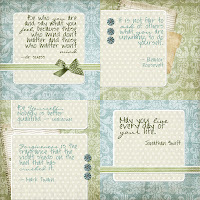 So over the weekend I Googled "famous quotes" and did find some that I thought were "Journal Worthy". I thought I would post my first 4 pages today. It was hard for me not to add pictures...but I was happy with the end result. 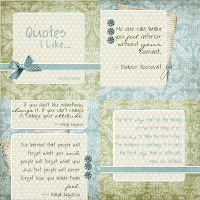 I think I may print it off and put it in my craft room...Now I have quotes *happy face* (you can click on the image to make it larger). I went grocery shopping yesterday afternoon and my battery light had come on (it actually came on Sunday after church), Mike had planned to take a look at it when I got back from shopping...well, after I loaded everything into the Expedition...I jumped in and tried to start her up...NOTHING! I guess it was a good thing we didn't go to the conference yesterday and I was thankful Mike was home to come and rescue me. Luckily it was only the alternator, which Mike replaced and it is running as good as new! Never a dull moment! Does that title make Monday feel any better? My weekend was crammed packed with stuff, and I still did not finish my homework from my digital class...hopefully today I will have time to do it and get to the grocery store, which I didn't get to either. 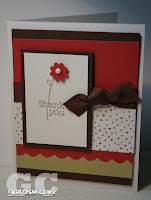 Here is a card I made last week (when I was on my Thank you kick). I haven't used this set in a while, so it was kind of fun dusting it off and inking it up. Have a terrific day and thanks for visiting! I was so happy to complete my first assignment in my Digi class! Now I have a few more waiting for me to start (hopefully they will go much quicker, since I am just practicing my new skills). 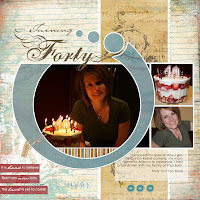 I decided to do a page about my milestone birthday (the big 4-0). I am usually the one behind the camera, so I didn't really have a lot of photo's to choose from, lol! I have another busy weekend in store...taking photos of Ashley and Nate for their save the date announcements, promised to go shopping with my hubby for some new spring clothes and shoes, the usual stuff...groceries/cleaning/laundry, and hopefully finishing lesson 1 B and my Cre8tive album in time for my next set of lessons on Monday. I hope I can fit it all in! 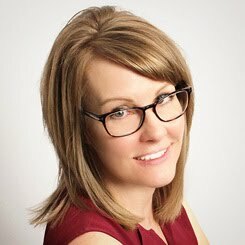 And a big shout out to my SIL Dawn...her birthday is Saturday (4/5) Have a super day! Thanks for visiting today and have an Awesome weekend! Today's card uses SU! 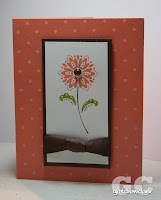 's Die Cut Blooms (available in the Occasion's Mini Catalog). I love the fact that you just punch them out and they are ready to go...no cutting! 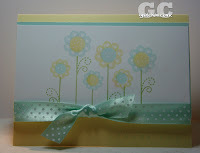 I paired them with the Summer Picnic Designer Paper (also available in the mini catty). 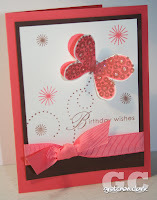 This card is not my usual color scheme, but I think it is kind of fun. Ashley asked me to make her wedding invites and save the date announcements...hope to start those real soon (6 months until the wedding, that just hit me yesterday.) She is planning an October 4, 2008 wedding, and now that we have the golf course reserved, it is moving right along. 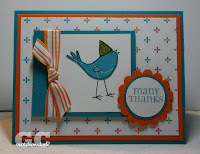 I will have lots of stuff to show you along the way...since I am making the favors too! (hopefully this will all be done early, so I don't have to much stress!). I am moving right along in my digi class and will hopefully post my page soon!